Time To Play The Green Tea Card? Ever wonder about the fact that the ideology of the two US political parties happens to be directly contrary to the implied ideology of their energy policies? We have a party on the right that espouses limited government, personal responsibility, local control and minimal regulation. The party on the left promotes the advantages of government, the value of regulation and places limitations on local decisions that are contrary to national policies. If there were a consistent ideology, the left would be the friend of all forms of central generation, looking out for the greater good through a national, centrally controlled and regulated transmission grid. Conversely, the right would be demanding distributed generation, local control of energy of all forms, and an end to large scale generation as well as transmission lines for which the providers of rights of way gain no direct benefit. That might be changing. A little. An odd coalition has formed in Georgia between members of the Tea Party and the Sierra Club called the Green Tea Coalition (https://www.facebook.com/thegreenteacoalition). The Green Tea Coalition (GTC) was organized in Georgia initially to fight, oddly enough, the Americans for Prosperity (AFP), the front organization for the Koch brothers, over a proposal before the Georgia Public Service Commission to require Georgia power to increase its solar capacity by 525 MW by the end of 2016. Ultimately the Commission voted to mandate the capacity increase. Since that vote in August the GTC have taken on the cause of cost controls for the Vogtle nuclear plant, in one of the few states where Construction Work in Progress (CWIP) is allowed in rates. They also published a Utility Customer Bill of Rights that would exclude CWIP and utility lobbying expenses from rate recovery. Just this month Georgia Power withdrawing a proposed tariff on residential solar, attacked as the “solar tax” by GTC. The Tea Party has been responsible for considerable political disruption of late, driven by ideology and misguided zeal. The argument that distributed generation under local control surely has an ideological appeal to them. Might rechanneling this energy to support greener, or at least olive drab technology options make sense in other regions? Where are the smart nuclear advocates? Enthusiasm for nuclear power among its advocates has found new energy lately and has generated reams of what they view as important arguments in newspapers, TV ads and industry forums. Instead of focusing on nuclear’s primary barrier to widespread use – economics – all manner of peripheral arguments are being made. Their arguments can be categorized as: 1) the public’s perception of nuclear risk is misplaced and would improve with proper education; 2) nuclear is in competition with renewables and they are therefore the enemy; and 3) nuclear is the low carbon option for the future. The first argument is actually irrelevant; the second is rather silly. The carbon argument could be useful to mitigate economics if there was a way to value it, but I doubt many large utilities and large industrials are avidly lobbying for carbon cap and trade or carbon taxes. Without something like those measures, carbon reduction is simply a nice sentiment. So what about the public? The fact of the matter is that, at least in the U.S., public perception or nuclear hazards has not halted the construction of any nuclear power plants, nor is it likely to do so in the future. What’s interesting is that this has been the case for the last 30 or 40 years, in spite of Three Mile Island (1979), Chernobyl (1982) and Fukushima (2011). Check out the results of polls between 1977 and 2006. The next figure shows the results of three separate surveys repeated on roughly a two year cycle between 1976 and 2006. Public acceptance was over 50% until the TMI accident. It remained below 50% until 1991 and has been above 50% through 2006. The figure below shows that a Gallup poll begun in 1994 and conducted annually from 2004 through 2012 shows that, with the exception of 2001; public acceptance has been above 50%. I have a suspicion that many advocates simply assume that its public fears that halt new plants, without knowing the facts. Anyone who starts down the path of arguing for nuclear by arguing against renewables simply advertises their lack of knowledge as to how electricity is generated, transmitted and delivered. Simply put, nuclear is base loaded power – power that is generating virtually 24/7. It competes in a wholesale market that contains the cheapest sources of power available. As demand rises, new generation is called, or dispatched, based on cost. Until there exists economic grid scale storage for renewables they do not compete with base loaded power. They do compete with renewables for subsidies, and lately renewables are getting a little more than the value of nuclear’s PTC, liability insurance, R&D and loan guarantees. If one adds up all the subsidies nuclear has received for the last 50 years, it will take a very long time for the aggregate of renewable subsidies to surpass nuclear’s, however. Nuclear power plants emit virtually no conventional emissions and are viewed by some either as “zero-emissions” or as “carbon free.” The table below shows the annual emissions of primary pollutants for three large power plants in Pennsylvania in 2009, as compiled by the U.S. Environmental Protection Agency (EPA). Nuclear has therefore begun to figure more prominently in national generation portfolios as part of carbon mitigation strategies. This is, however, an area of controversy. Like the electric car, emissions are not limited to what the device produces but what emissions occurred to construct and fuel it. While the power plant does not emit carbon or other harmful compounds, the processes used to manufacture the fuel, plant construction, nuclear waste management and decommissioning all have their own carbon footprint. And as with most technologies that are politically charged, there are studies that will support almost any position. The IAEA conducted a study to assess the full range of emissions over the life cycle of the power plant. The results of their most recent work are shown in the following table. A researcher at the University of Singapore surveyed 103 different life cycle greenhouse gas emissions studies involving nuclear power. Of that population he qualified a subset as havi8ng sufficient detail and appropriate methodology. The result is summarized I this table. The results of this survey give a more realistic appraisal of nuclear carbon emissions; nonetheless nuclear remains low in the list of alternatives. And as with all politicized discussions, you can find a study that supports nearly every position. Deal with the real elephant in the room – cost. It’s clear that the all in costs of new nuclear plants are more expensive than their alternatives in free market economies. What is the value added that makes it worthwhile to pay a premium for nuclear? That is the key to greater market penetration. Find value propositions that rationalize the premium. One value added could be carbon mitigation. Unfortunately it has no quantified value in the US at the moment, but could offset part of the nuclear premium if it were valued. Nuclear advocates should get squarely behind any legislative initiative for a cap and trade market for carbon or carbon taxes that can be quantified and avoided. The nuclear power industry has begun to receive serious attention once again with the promise of new reactor designs and has increasingly been named among the portfolios of national governments as long-term sources of electricity. Unfortunately, this industry has a long history of over optimism in terms of both the readiness of technology and its economics. Those parties interested in determining the kinds of growth opportunities in nuclear power business sector might offer them need a realistic appraisal of what is likely to emerge in the next eight years. This report answers several questions regarding commercial nuclear power: Is the perceived resurgence of this industry plausible and if so, how much of a market does it constitute? Are nuclear capacity addition forecasts accurate? Are cost estimates for plant construction and operation reasonable? How does the cost of electricity from these new designs compare with alternative sources of electricity? This report also attempts to provide some context to the business of nuclear power, insight as to why it declined in the 80s and then remained dormant over much of the 90’s; what issues have been resolved since then and what barriers remain. 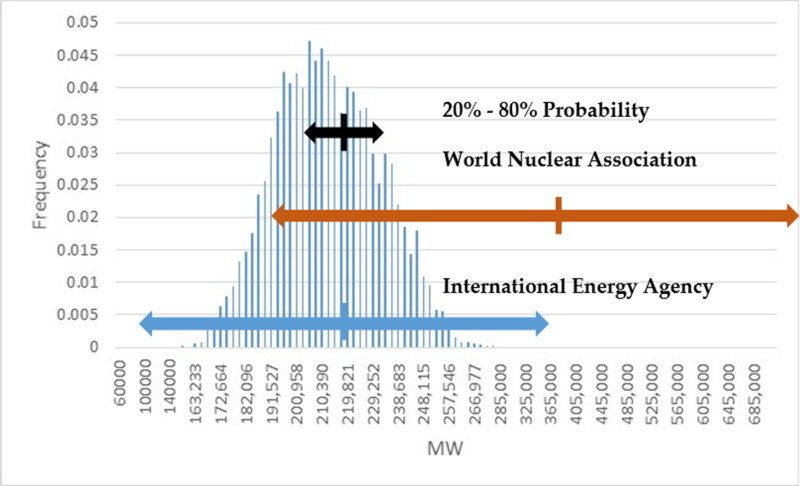 Probabilistic forecast of new nuclear plant capacity and investments through 2030. Forecasts of capacity additions as well as capital investments in nuclear power from 2014-2030. A more meaningful way to look at the growth projections of this industry. Private sector company financials and plans from investor and conference presentations. In addition, we consulted secondary sources for the report, including industry journals and publications, product literature, white papers and technical journals, and financial reports for industry suppliers. All Key Participants cited in the report were given the opportunity to be interviewed or provide input and most complied. The base year for analysis and projection is 2014. With 2014 as a baseline, we developed market projections for 2014 to 2020 and then to 2030. These projections begin with a database that synthesizes the above sources. We then combined its unique understanding of the key market drivers, and their impact from a historical and analytical perspective, with scenario and probability based forecasting techniques to capture the uncertainties in the forecast. Each of the market forecast sections in this report give detailed descriptions of the analytical methodologies used. All dollar projections presented in this report are in 2013 constant dollars unless otherwise cited. Commercial nuclear power generation has had an unsettled role among the world’s choices for electricity generation. There have been periods when it was hailed as the single best option for long term, large-scale economical electricity generation. There have also been periods where, at least in certain countries, nuclear power generation was regarded as anathema. Indeed, during the 80’s and 90’s, very few nuclear power plants (NPPs) were constructed. Beginning in the early 2000’s nuclear power seemed to be making a comeback with the promise of safe, environmentally sound and economic power generation delivered by a new generation of reactor designs. A few environmental groups even accepted it as having a place among low carbon energy source portfolios. In this decade, most countries are planning for a future where sources of electricity are environmentally benign, but sufficiently robust and economic to fuel strong economic growth. Developing nations view energy and electricity as a potential constraint on their economic growth; their available energy needs to stay ahead of their economy’s leaps and bounds. Nuclear power is a strong consideration in these countries but less so in developed nations where capital is limited and energy demand is flat. In 2011 it accounted for about 12.3% of electricity supply worldwide; in 2012 about 13.5%. Much of the enthusiasm for nuclear comes from the promises of several new reactor designs including advanced pressurized water and boiling water reactors (PWR and BWR), as well as gas cooled reactors and fast neutron reactors (GCR and FNR). These new designs have passive safety measures that allow for safe shutdown without operator intervention. In addition, another group of small modular reactors (SMR) are in development that are scalable to meet specific energy demands of several hundred megawatts (MW). Many of the same issues that plagued nuclear power in the past remain unresolved: cost; waste management; decommissioning expense and perceived risk. The Fukushima-Daichi incident in Japan in 2011 heightened awareness to these issues and caused reductions in many nuclear power construction plans. Assessing business opportunities in nuclear power is no simple task because of its hybrid nature. Governments developed the technology as an adjunct to nuclear weapons and nuclear submarine programs. Construction and operation of NPPs remains a government role in most countries. In fact, it is fair to say that nuclear power fits best in the context of large centrally planned economies where substantial financial resources are available and where the government bears the economic and technological risk. Nuclear power is nonetheless a commercial venture in some free market economies with varying degrees of autonomy from government control with a very large network of fully commercial suppliers for components. Governments and the supplier sector, both of whom need to market the viability of the technology and influence public opinion for continued support, heavily influence most forecasts of nuclear power growth. Some governments chose to be rather opaque regarding details, especially regarding costs and the extent to which reported costs are subsidized. These circumstances have resulted in consistently overstated forecasts and overly optimistic anticipated costs, traditions that continue today. We believe a reasonable approach to assessing this industry incorporates a probabilistic forecast of new capacity and investment. Figure 1 and Figure 2 present our forecast of cumulative new global nuclear capacity and the corresponding investment required. 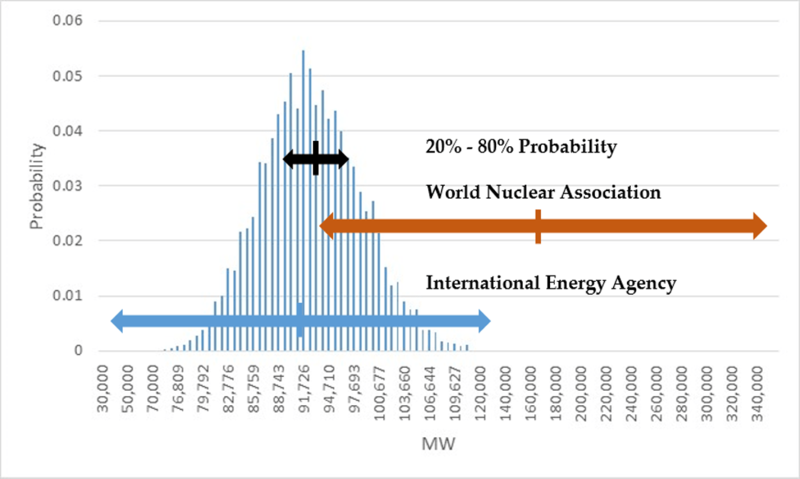 The figures indicate that the likely range of either metric are significantly less than that of the World Nuclear Association (WNA), but within the (rather broad) range of the International Energy Agency (IEA) forecast. Figure 3 and Figure 4 present these capacity addition forecasts in terms of the necessary investment required (on an overnight cost of capital basis. 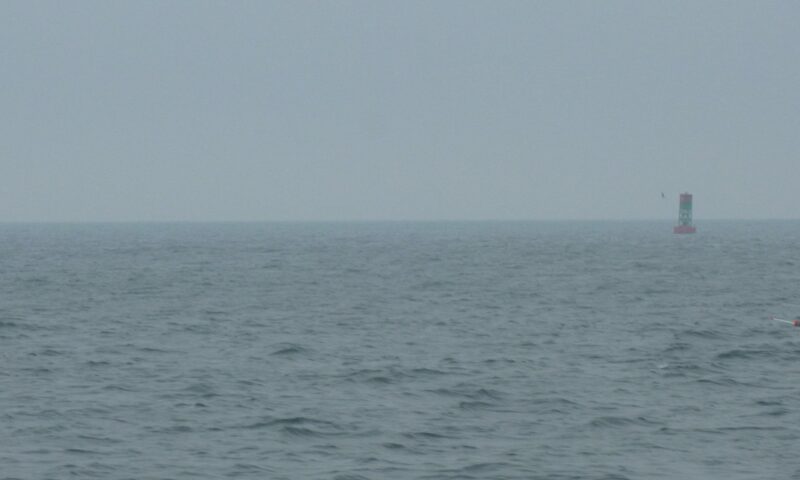 $2013). 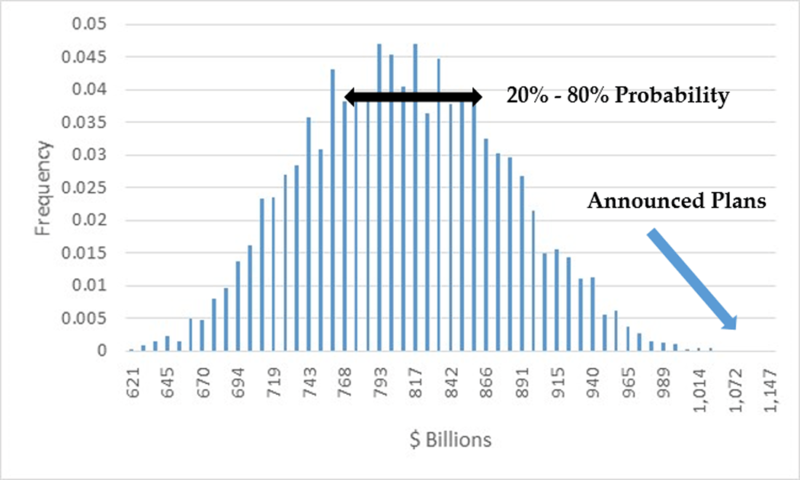 Note the disparity between the probable range of investment and the amount that would be required if all announced plans were realized. Worthington Sawtelle LLC believes these probabalistic forecast are likely to be far more accurate than the announced plans of the various industries. 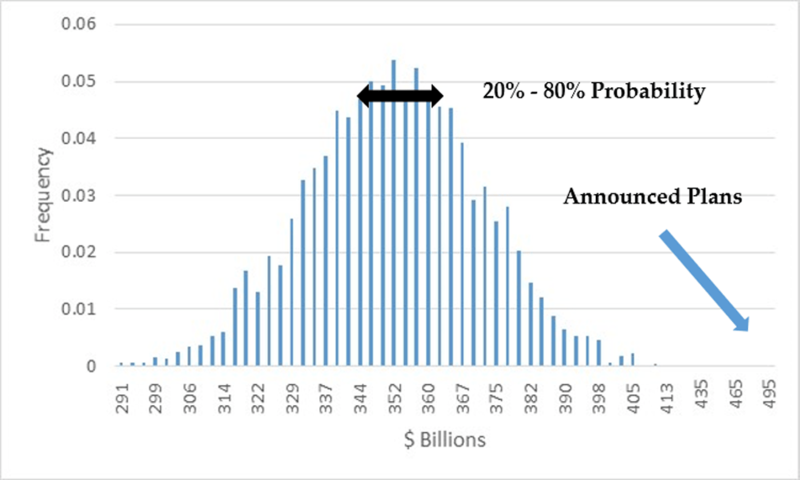 International agencies have adopted a “high/low” forecasting basis that is so broad as to be meaningless; nuclear industry associations project capital additions about double what this probabilistic based forecast suggests. A “nuclear renaissance” of sorts is happening, although not in the West, but in China, Russia, Korea and India. Growth in decommissioning services will build with capital expenditures for decommissioning potentially rivaling or even surpassing new builds.